Less Stress for Teachers: More Time & An Organized Classroom addresses the thinking behind how to overcome "the overwhelm" that teachers feel on a daily basis. Teachers are bombarded with hundreds of tasks and decision-making situations per day, but they are often not given the tools to cope with all of that. Learn how to become an organized teacher with an organized classroom. Use this as a first year teacher's survival guide or a veteran teacher's journey to achieving classroom organization and less stressful school days. 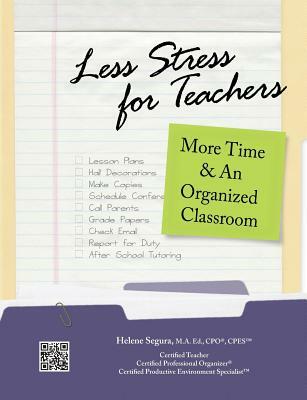 Organizing and productivity expert Helene Segura has been involved in the education world since 1993, when she began her career as a teacher. While spending more than a decade in the classroom at a Title I school, she developed organizational methods that she now shares with her clients. She transitioned into the organizing business, becoming a Certified Professional Organizer(R). As the owner of LivingOrder(R) San Antonio, she has provided individual coaching for clients and productivity workshops for non-profits, schools and businesses. Helene serves on the trailblazing team providing organizing help at The Clutter Diet and has been a featured organizing expert in publications such as Woman's Day, as well as on Fox, CBS, and NBC affiliates. Helene is a straight talking, no holds barred, driven innovator who wants to make the world a simpler and more relaxing place through education and humor. She helps people regain control of their stressful living and working spaces by teaching clients how to understand their core issues causing disorganization and thereby prevent it in the future. Helene is structured yet free-spirited. She is serious when she gets down to business, but her wicked sense of humor sneaks in to lighten the mood. Her writing reflects who she is. Born and raised in Los Angeles, a former soccer player for Texas A&M, and an avid traveler, her wide variety of life experiences and exposure to cultures around the world allow her to offer unique insight and assistance to her clients. Her background in education allows her to pass these skills on to her clients. Helene earned her Bachelors degree at Texas A&M University and her Masters degree at the University of Texas at San Antonio. She holds teacher and mid-management certifications from the state of Texas and has earned Who's Who Among America's Teachers and Teacher of the Year honors. Helene is a member of the National Association of Professional Organizers (NAPO) and its local chapter, NAPO San Antonio, for which she was one of the founding members as Director of Communications and Technology. She is a National Trainer for NAPO's Quantum Leap program through which she volunteers at local non-profits. Helene serves on the Board of Directors for the local chapter of the National Association for Female Executives (NAFE). She is also the Director of Communications for the international Board of Certification for Professional Organizers.